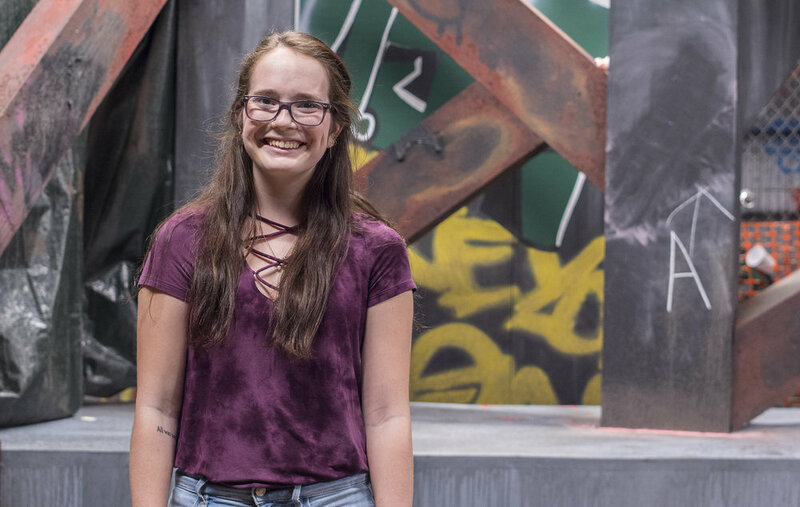 Maddie Walsh is a third-year theatre major from Savannah, GA. She is the set designer for the production of In The Blood. We haven’t had an undergraduate do a scenic design in a while! The last time an undergraduate designed a set was when we did Clybourne Park in 2014. What has this experience been like for you? The experience of designing as an undergraduate has been unlike anything I could have imagined. I knew that it was going to be very time-consuming, but having previously only done theoretical designs and those for student groups, there was even more to do than I ever thought possible. I think that designing this show has really forced me to change my way of thinking. It’s very weird having to make a decision for every little thing. It differs because in a student group design, saying “whatever is easiest” is a totally valid response for a question. But when you have the shop building the set and the budget to support what you actually want, you have to be able to think of exactly what you want and communicate that to a design team, shop supervisors, and directors who have a lot more experience than you. The weekly meetings that have been going on since September and having to make concrete choices on a daily basis and being an undergraduate on a team of “the real adults” creates a lot of pressure to make everything piece together nicely. But as we’re getting into tech week and seeing the size (both physical and in accomplishment) of the design I’ve created is incredibly satisfying. What is the concept behind your design? What was the inspiration for your design? In our very first design meeting, the director Martin Wilkins set the challenge of pushing the abstraction of this play which is set in the very concrete location of a bridge. Martin then showed us all some images of chalkboards and wanted to see if there was a way to tie in the chalkboard to set. He also talked about an artist named Jean-Michel Basquiat who created a graffiti tag called SAMO which overtook New York City in the late 1970’s and early ‘80s. With all of this in mind the concept of my design became an architectural underside of the bridge where Hester and her children live. The audience is invited to see into Hester’s home, but the crossing beams and half complete architecture create an implied illusion of the bridge without spelling it out directly. The chalkboard serves as a way create and destroy graffiti throughout the show and as a practice place for Hester to practice her literacy. As far as Basquiat, I wanted to create a juxtaposition between Hester’s child-like hand and that of a more experienced writer. SAMO styled graffiti overlays a more traditional style and creates and written, in the moment, picture of time. If you could, then how can you briefly describe In The Blood in just a few words? In a few words, In The Blood is the story of a woman named Hester and her five children as they struggle with stability and attempting to get a leg up in a society that continuously traps them in a cycle of poverty. One really important message that the entire creative team has been keeping in mind about this whole process is that we cannot dehumanize the homeless. If you look closely, you’ll notice that even though the conditions in which Hester and her children live are poor, Hester does everything she can for her children. There is litter and trash all outside the chain link fence of Hester’s home, but it’s important that Hester keeps her space tidy for children, she lets her children eat while she goes hungry, and she makes all the same sacrifices that our parents would do for us. Hester’s being homeless does not make her any less of a human being and I think that’s how our government tends to treat those who are struggling with finding permanent homes - like they’re less than human. The Guardian published an article in 2017 about how cities relocated their homeless citizens with one way bus tickets. Using smoke and mirrors, they say that they are reducing homelessness. But in reality, they are forcing desperate people to sign contracts for these tickets, which then bans them from using shelter services or even returning to the city. Or how in 2017 Atlanta passed a law saying that it is illegal give food to a homeless person without a permit and those caught can be ticketed. Atlanta enforced this new law and stated that feeding homeless people prevented them from finding long term solutions, but did not acknowledge that sometimes people need immediate help. I think the reason that this show is still relevant today is because in 2019 lawmakers in government are still blind to the notion that the homeless are people who deserve clean resources and steady food and that without a leg up its a cycle that is incredibly difficult to break.